Ok so Friday night was movie night for CSP and me. We went to redbox and picked up Traitor and Pineapple Express. Traitor was serious, well acted (LOVE Don Cheadle), and really good. I was surprised to see that it was written and produced by Steve Martin! Pineapple Express was one of the funniest movies I’ve ever seen. We had to keep pausing it because we’d be laughing so hard I’d miss some dialogue. It had some of the best lines. Thug life! Saturday morning we got up at the crack of dawn to meet up with the fam. 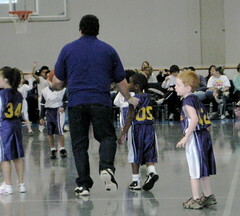 It was Jacob’s first basketball game. OMG it was the cutest thing ever! A million tiny little 2 foot tall kids with those long shorts pulled up to their armpits running around trying to put the ball through the hoop. I wish I’d had my good camera because the zoom on my purse camera doesn’t cut it. Jake ran around the whole time with his arms up in the air like a redheaded orangutan. He’d get distracted by the scoreboard or would start spinning around in the middle of the court. And he could barely take his eyes off the cheer leaders. SO cute! After the game we split up. 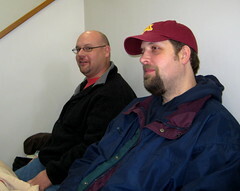 The boys all went back to Sara’s house and us girls went out to lunch for Gigi’s birthday. She wanted to go to her favorite, Red Lobster. At lunch Sara caught us all up on her medical situation. She has been diagnosed with Autoimmune Hemolytic Anemia. Not fun stuff. Her spleen is still big, and she has more tests tomorrow. Hopefully she’ll be able to get her spleen taken out ASAP. She’s so pale, in a good deal of pain and discomfort, and is starting to look jaundiced. Please keep her in your prayers. She’s keeping a great attitude about it. 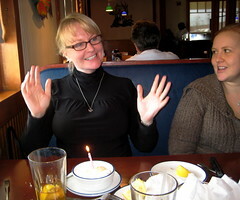 The staff at the Red Lobster heard it was Gigi’s birthday and brought her an ice cream and sang. Then after lunch we went for a movie. We debated between seeing the Unborn and Gran Torino. Thank goodness the ticket guy talked us into Gran Torino. The Unborn looked like it was just going to scare me into insomnia for months! I’m too old for all that public terror. Gran Torino was fantastic! I’ve always respected Clint Eastwood but didn’t really become a fan until Million Dollar Baby. Gran Torino was hilarious! And touching, and intense, and scary. We laughed, a lot (didn’t expect that), and we cried. After the movie we went back to Sara’s then Momo went home with Papa & Gigi. She had to get ready to go back to school to start the semester today. I miss her already! But she’ll be home again next weekend for Joey’s birthday!